“Buchanan Street bus station forms one of the main transport hubs in Glasgow where we see a vast selection of vehicles including Routemasters from Stagecoach & Clydeside. RM441 (WLT 441) is seen here, being an RM that eventually passed to Black Prince of Morley and can be seen on the ‘Routemaster in Central England’ programme. RM416 is also seen in its strange half & half livery, part London Transport and part Clydeside. A look at Routemasters arriving and departing from South Nitshill has amongst them RM17 which carries an all over advert for ‘Westcars SAAB’. Filming at Paisley looks almost like London with Clydeside’s RMs and a Grahams DMS for good measure! 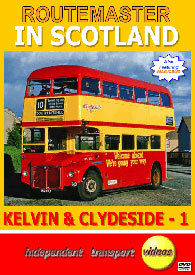 At Clydebank there is competition for Kelvin’s Routemasters in the form of Strathclyde Leyland Atlanteans. It is interesting to see from the aerial views just how quick customers can get on and off the RMs as opposed to having to queue to pay the driver of a one man operated bus. With a conductor being quick on the bell can keep you ahead of the competition, so its ding ding and off to Clydeside’s Johnstone Amongst Routemasters seen here is RML900 (WLT 900), which was written off after an accident in London and was purchased by Clydeside. It was repaired and put into an advert livery for the Sunday Post newspaper; the advert features ‘OOR WULLIES SPECIAL’. RML900 was named ‘Rabbie the Routemaster’ keeping up the tradition of naming them with a boys name beginning with the letter ‘R’, the only exception being the RMA turned out in Quicksilver colours, which was named ‘George’. Several more Routemasters were purchased to help out with the Glasgow Garden Festival, these being painted red with the small relief band in yellow. RM2208 is seen in this guise, unknown to me at the time, I was to purchase this Routemaster from Black Prince of Morley and return it to the George Shillibeer colour scheme of 1979 when London celebrated 150 years of London's buses. garage! A further look at central Glasgow sees Kelvin’s RMs on the 5/5A routes as well as an array of other operators buses. Clydeside RM54 is also is seen, and this bus was later purchased for preservation and put into an early Blackburn colour scheme. Subsequently it passed back to London to be refurbished before its revenue earning career continued again in the capital. At Stepps garage we see no fewer than 17 Kelvin Routemasters lined up in the yard. Inside the garage we see further RMs that are being used for spares to keep the iconic fleet on the road. Kelvin’s gold Routemaster, RM371 advertises the company’s Gold Card and was named ‘THE GOLDEN RETRIEVER’. RML900 returned south before entering service in Scotland and is seen at the North Weald rally”.